Red Bay Alabama | Follow the Tumble Lees! Red Bay RV Park, 820 4th St., SW, Red Bay, AL 35582, Site # 4. It was time for our annual trek to Red Bay, Alabama, home of our Tiffin Motorhome, named Tiffany after our precious tween dachshund (1982-2006). We had a few pressing things Bill wanted to get done and if the weather cooperated, we would go this winter in March, rather than May. We didn’t set any winter travel expectations – it depended on the weather. And it looked like the weather would cooperate. As with most full time RVers, we avoid snow and freezing weather. But we never thought we had to consider tornados in March!!! This post will be in three parts: 1) RV repairs/maintenance/remodeling; 2) Hiking in Tishomingo State Park; 3) Weather issues such as a tornado! 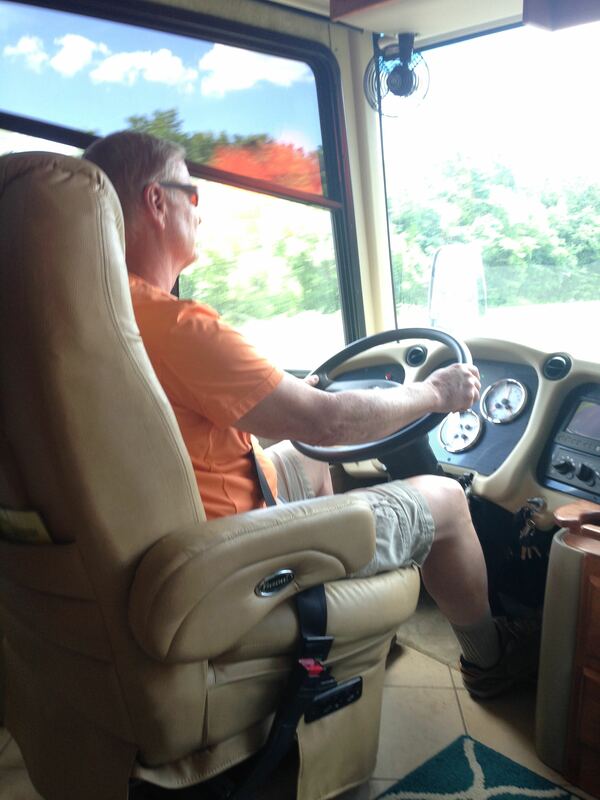 While Bill never doubted he could drive a 40′ motor home, he had serious doubts after the first trip. We purchased it in Cocoa, FL, then drove to Suwannee River State Park, Live Oak, Florida then to Troy, Alabama and then to our final destination of Red Bay, Alabama. Read about that journey here. He said starting out on I-95 North was not the best way to get broken in. But once we turned west on I-10, he was a bit more confident. 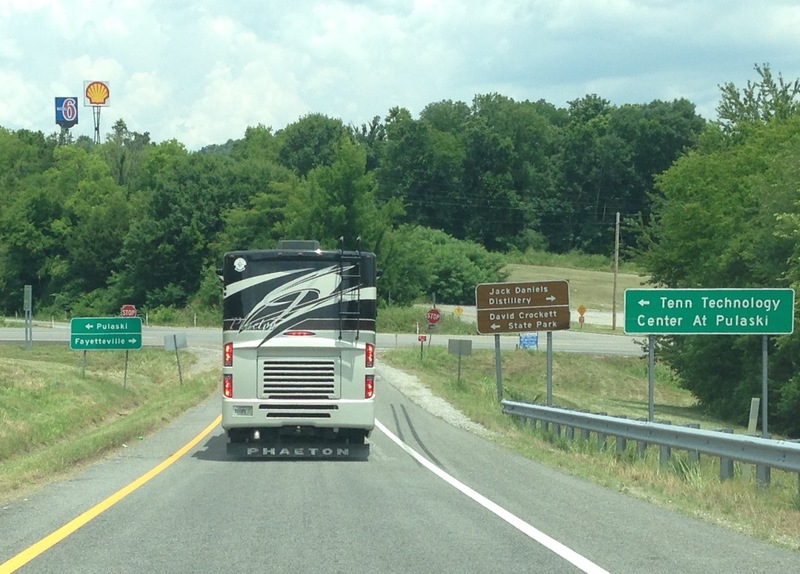 And then things went pretty well until we got close to Birmingham, Alabama….reminiscent of I-95 North. But worse! And then things were ok from there to the border of Mississippi and turning north to Red Bay, taking Mississippi County Road 23. That’s where Bill’s white knuckles about had it! 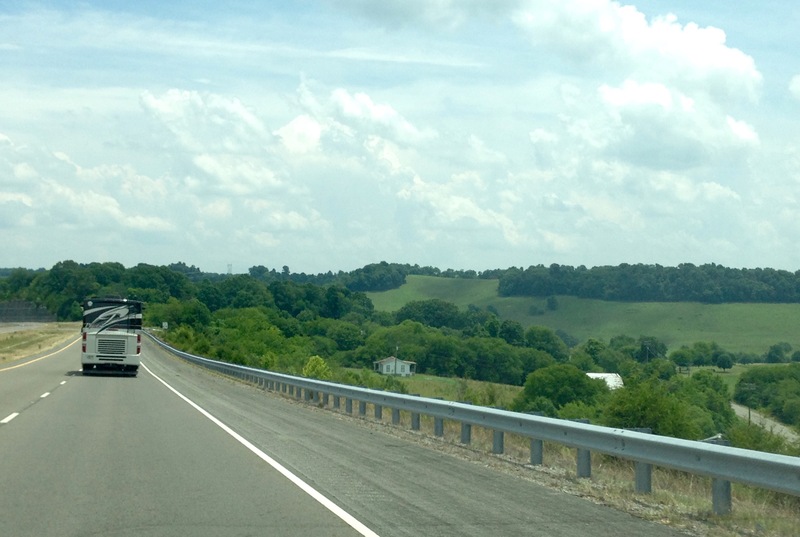 It’s a very narrow, winding road without any berm for safety if your wheels go off the road (like when another big truck passes you and you need to move over close to the edge of the lane). 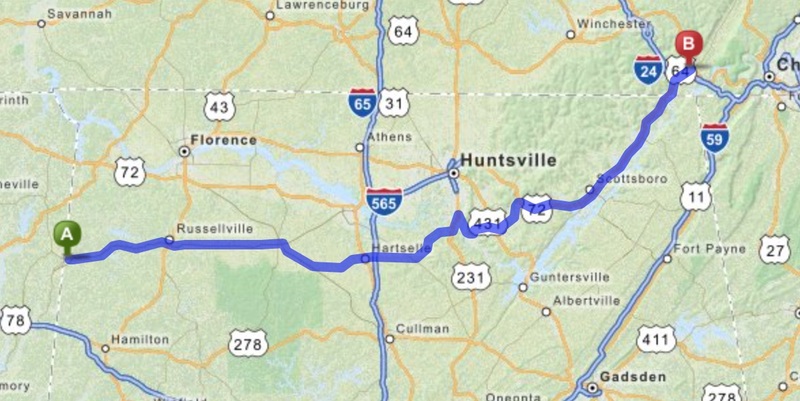 It SHOULD have been approximately 180 miles and 3 1/2 hours from Red Bay to Jasper, TN. 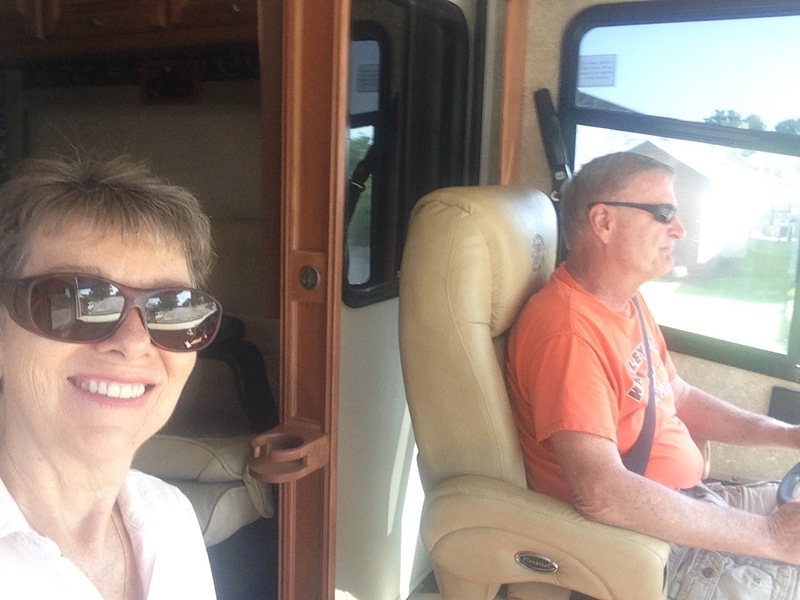 We are starting out with our new navigation system (Garmin) in the RV with Debbie still following in the car with the relatively new navigation in the new (old) Cadillac, SRX. Wouldn’t you know we couldn’t get them to match, so it was a bit confusing. Bill decided to just read the paper directions we printed. But he forgot he was still trying to get comfortable and couldn’t grab them while driving….So we missed that first turn! So Debbie’s navigation system recalculated and recalculated and recalculated. So she called OnStar which is a courtesy with our car purchase. They tried to recreate the trip for her – but Bill had the paper directions and Debbie could only say “southern and avoid big cities.” Bill was following and really doesn’t like to talk on the phone (no hands free set up for him). Debbie decided to pull into a “Visitor’s Center,” Wheeler National Wildlife Refuge, to talk about the route. 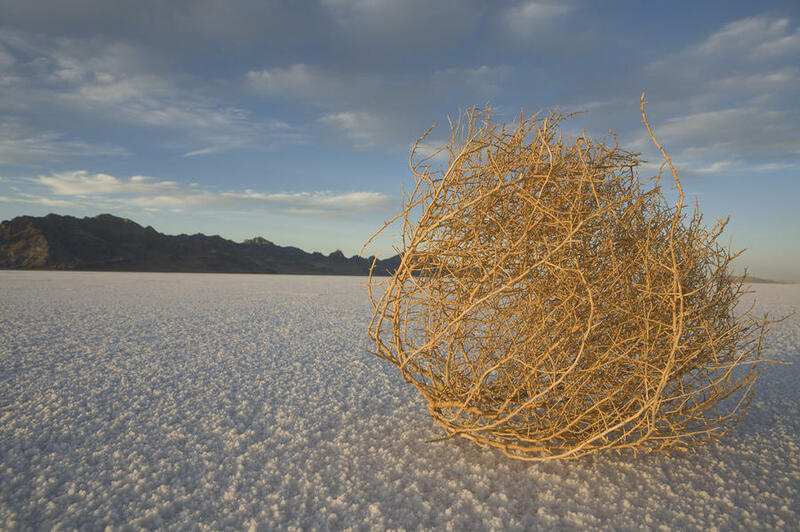 We did get to talk….and then…. No Visitor’s Center in view! OOPS, this means he will have to make a U-turn as there really wasn’t a visitor’s center as Debbie had hoped, at least not near the road. We both took it in stride…at least the weather was good and the road was flat (as in no mountains). We jumped on I-65 and headed north, noting it was now going to take about 4 hours to get to Jasper. So we thought we would only lose 30 minutes. 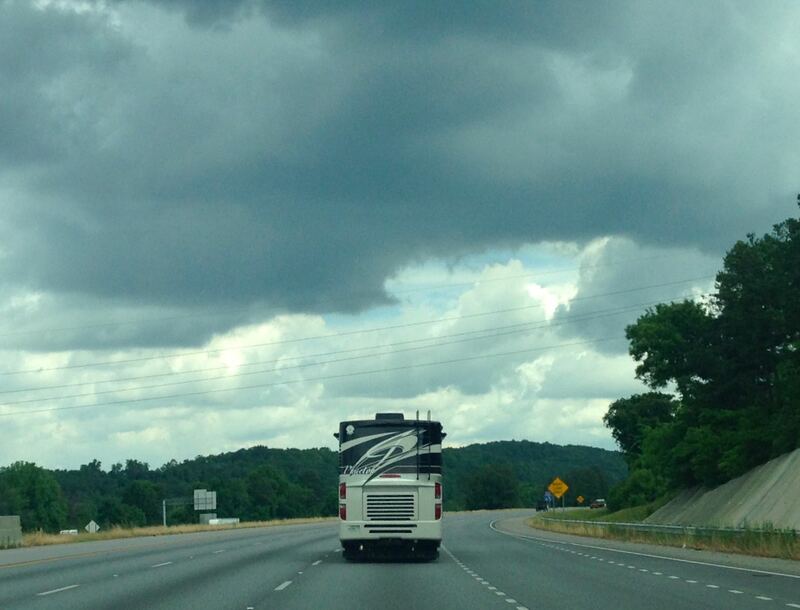 But it was such a beautiful day and we were happy to be in Tennessee….life is good, we’re thinking…. Bill was happy saying he now had 1,000 miles under his belt. That makes Debbie VERY happy! Just beautiful blue sky and rolling hills…. But then there was a detour off onto County Road 41 off of CR 65. We thought we were heading to I-24. So long story short, it began to rain heavily and we’re lost in spite of our GPS systems and OnStar. Well, let’s say, Debbie was lost and Bill wanted to go one way but Debbie insisted on following OnStar’s suggestion. Fortunately, Debbie pulled into a good area for a quick conference call and a U-turn….while talking on the phone, Bill says, “Oh no, my wiper blade just fell off.” Did I mention it was raining heavily? Oh no, my wiper blade just fell off! Debbie is a woman of prayer. So as she pulled into this turn lane for the U-turn, there were only a few cars, then suddenly a lot of cars! So she pleaded with God for safety while Bill hopped out to put the blade back on (fortunately we had just stopped at the right time and place for it to land) and Debbie had to do the same – to take a picture. This was starting to get funny….to her…. And the trip just now got interesting. We’re not sure how it happened but we got on the type of road Bill said he’d NEVER drive on. One of those narrow county roads with lots of switch back curves, in the mountains with little to no berm and “cliff’s” on the other side of the road, with lots of pick up trucks in a hurry to go no where. And it’s raining….No pictures but it was scary and Debbie was in the small car! But then, we got to the top of the hill and now it is a four lane highway…BUT and also 6% grades…AND runaway truck ramps, three of them! This is not good for Bill….and it’s back to white knuckles. At least it’s not raining now! This may be a bit long, so time to bring it to a close! 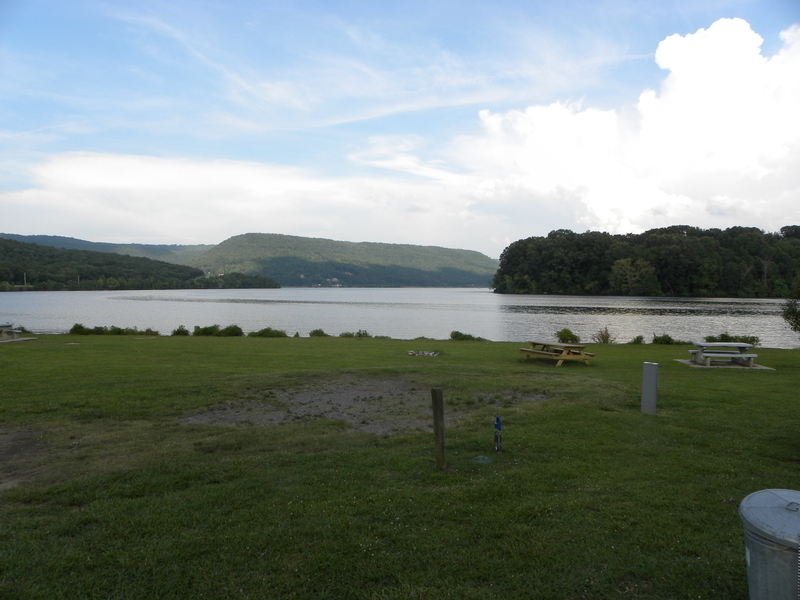 Somehow, we found this quaint little county park, Marion County Lake and Park, right off of the Tennessee River! Our review here. It only took us six hours, rather than the 3 1/2 we hoped it would be. So much for a relaxing and enjoyable afternoon. The sites were not clearly marked so we initially pulled into the wrong site. It wasn’t a real level site, so one tire didn’t quite touch the ground, but we had no choice and were just too stressed to try to re-park the motor home again. But somehow, we decided it was so beautiful, we had to take a walk around the park. We were the only motor home. There were many trailers and 5th wheels near us and on the other side, lots of tenters. We had water and electricity. There was a dump station near the office. It was a nice of enough of a location to stay two nights…and we needed that time to “chill” out! Our site, # 28 A & B. Debbie is more relaxed than Bill. Another view. That bridge is I-24, going over the Tennessee River. 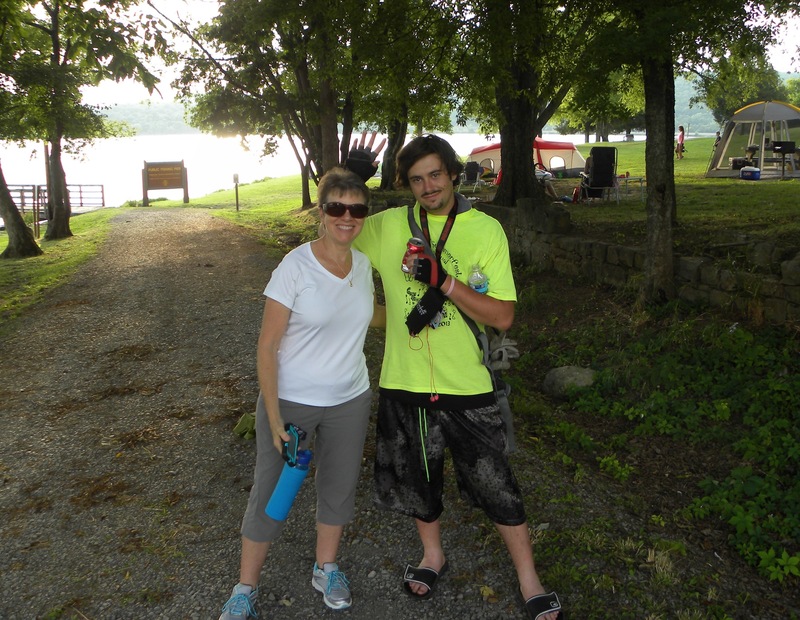 We walked over two miles, taking about 45 minutes walking time..
And then we met an interesting young man who just dedicated his life to Jesus – and who happened to be from Wyoming, near where Debbie was born. Not many people are from Wyoming…. Aspen said he never knew anything about Jesus. He was homeless at the time, just traveling with a tent and on his bicycle when he came to the know who Jesus is in Chattanooga. He was robbed twice there. Not that he had much, but his dad had given him a really nice tent. He said the Lord said He would be provided for, He just wants him to cross America and spread the news of His Gospel! So please pray for Aspen and his journey. After all this, Bill said he no longer has any doubts he can drive the motor home in just about any condition. But we really need to watch the weather. Our second day there we took a great hike, nearly five miles, around Foster Falls! Photos for that are uploaded here, onto Flickr. So guess how our next trip went? 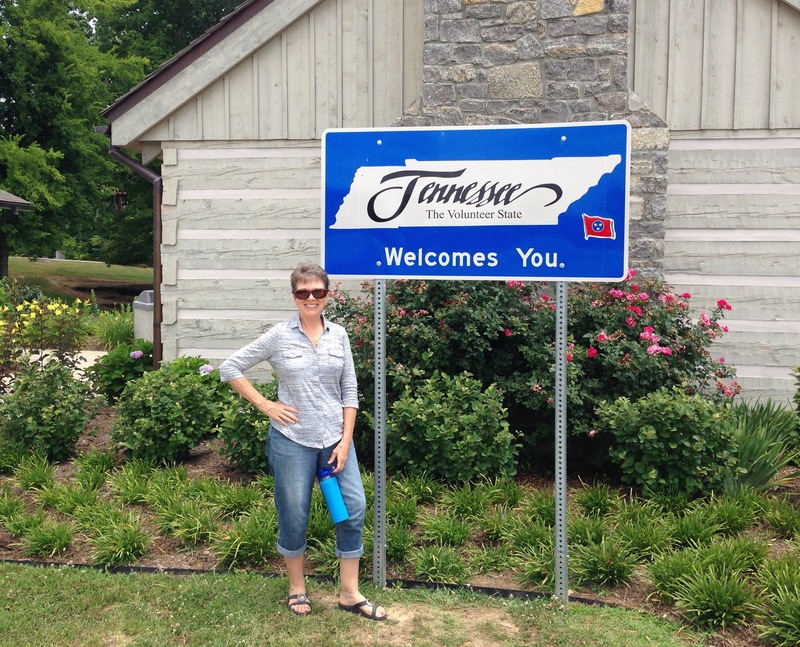 Heading to Bristol, Tennessee…. Our site, # 18, between our new friends! We’ve sure enjoyed our time in Red Bay, Alabama. We’ve had others tell us there isn’t much to do here, but it depends on what your definition is of fun! We will agree there isn’t much in the way of entertainment, night life, or a great selection of restaurants or shopping. But for us, we love to cook our own meals, we only shop for what we really need and between Amazon.com and Walmart, we are kept stocked. We love the Lord’s creation, there is a lot of that here. I just read a review of the play Les Misérables in our home town. The most famous quote from this iconic movie is, “And remember, the truth that once was spoken: To love another person is to see the face of God.” (Victor Hugo). We must admit, our belief system demands we love others. So we do love people, or at least try. Some are more lovable than others….but who couldn’t love all these lovely people! They have been so patient and kind. You never hear them lose patience with any of us, but yet, so many of us lose our patience with them. What we have found here that we’ve never found before is a WEALTH of information from other Tiffin owners. That has been refreshing. And the people we are meeting has been energizing. Everyone has a story, so talk about entertainment, just to hear some of the stories will keep you laughing or crying! So back to our diary! We did have a technician install a hard-wired surge protector for us over the weekend. There are some jobs it’s easier and faster to “hire” out. Monday, June 15, 2015 We got a break from the early morning assignments. This day, we hade a 49 mile road trip one way for another “good will warranty” repair. For about 3 years, Tiffin used plywood in the wet bay area, and we were one of the units that needed it replaced. Our appointment was at 10:30. Happy to head out at a “reasonable” hour! Debbie finally got to ride as a passenger (the car is not set up to flat tow as of yet) and she loved the comfort of the passenger seat. 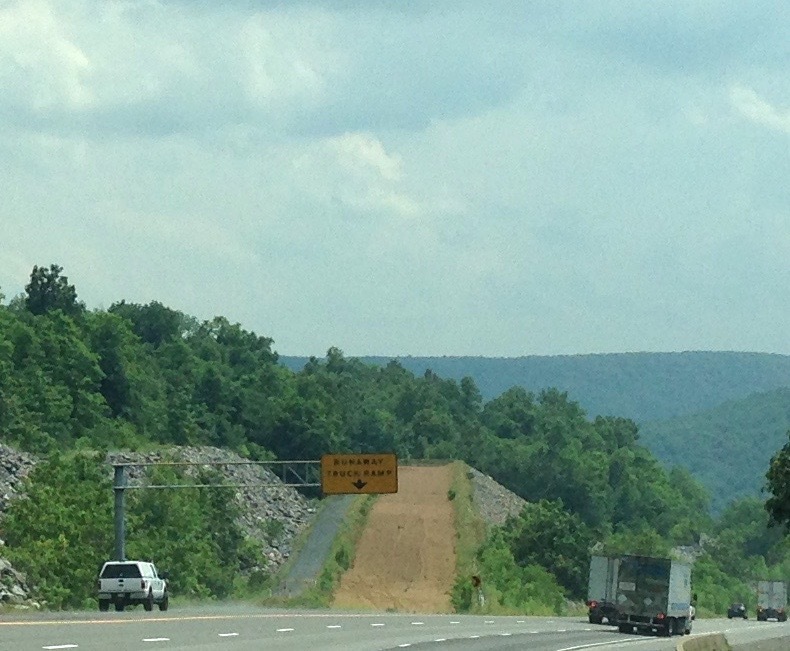 And it was a gorgeous drive in the rolling foothills of the Appalachian Mountains. Bill was so much more relaxed. No white knuckles today! 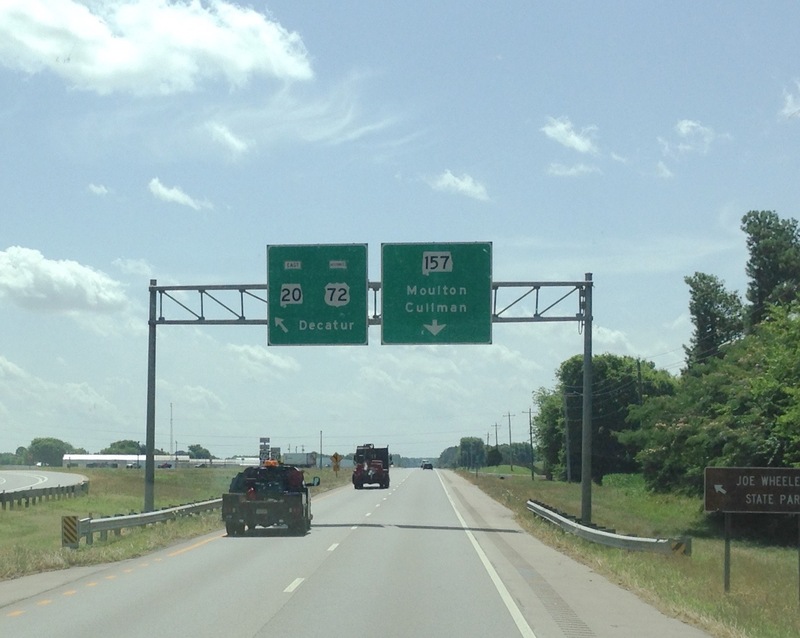 Follow 157 to Moulton and Cullman where 20 & 72 split. THEN turn left immediately into Kimbrough. They are remodeling the building so we sat in a brand new lounge that needs a bit more work. But the chair and couch were comfortable. It was about a three-hour repair. It is just amazing we are getting this work done under the “Good Will Warranty.” Bob Tiffin has a wonderful reputation. His quality of workmanship seems to be a dying art. We arrived back at the Service Center too late to get any more work done. We still need a few little things and one more big job. But we enjoyed the rest of the day. Bill wiped down one side and the front of the coach. Debbie was able to get in a long walk and visited with the neighbors. We know we will have another early morning so we didn’t stay out late. Bill’s hobby, polishing our new home! 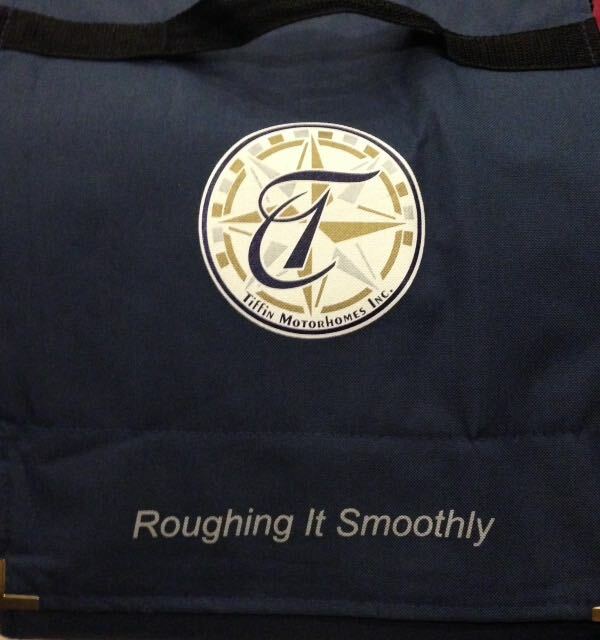 Tuesday, June 16, 2015 – This day is crunch day! Time for our main slide floor to be replaced, so we arrived in Bay 47 at 7:00 am. We were never told how to prepare, but we heard we’d need to remove a few things. The technician helped us and then we went to the customer lounge until 11:30. Debbie walked by it to get a few pictures. It’s a bit unnerving seeing your motor home wide open! That is the back of our residential refrigerator. And the slide is laying on its side with the dirty looking canvas. The crane lifted it off. It would have been fun to watch it going on and off, but at least we saw how it came together on the factory tour! Our Coach with the main slide taken off. We were told it would be done at 11:30, so we checked in with Shane, our original tech who ordered the parts for our washing machine and entrance light panel. His boss was standing there, so he arranged for it to be brought to his bay for the final touches. Oh how hopeful we are that we will be done today and can head to Virginia tomorrow. Our daughter checks on us regularly to see when she can expect us. Being 8 months pregnant and working full-time is not easy with a toddler. And we miss him! We were able to stay in the coach while Shane and his assistant worked inside. The work was completed by 3:00. He said our paperwork would be completed in about 40 minutes, so we drove the coach back to our site and set up. Debbie put a load of laundry on – but had trouble getting the washer to work. Shane came over after giving a few suggestions via text message. But by then it was working. Debbie is a happy camper! About 40 minutes later, we went to get our final bill. We were very nervous about how much all this work would cost…..But we were so HAPPY and amazed at how low the bill was. No wonder there is so much brand loyalty! The most expensive thing was the exhaust pipe. It was a miracle it hung on until we arrived here. We went home ready to plan our trip to Virginia. We have to go through the mountains so need the best possible route. The drive to Kimbrough was a great opportunity to practice riding in the hills and using the engine brake. And since we got up at 5:30, we were ready to relax for the evening. Actually, we were both too tired to try to take a walk. It is hard work hanging out while people work on your home! While we were cooking dinner, we noticed the air conditioner didn’t seem to be working right. Debbie came up with lots of excuses/reasons. But Bill was concerned there was still an issue. It was one thing we had looked at – and they said it was in the sensors so they were replaced. Wednesday, June 17, 2015 We woke at 5:30. Bill didn’t sleep well, concerned about the A/Cs. He wanted to talk to a technician. But Debbie said, “It’s time to go!” It felt like they were working to her. But Bill warned about “feelings.” He said you need common sense. But nevertheless, we got ready to go. 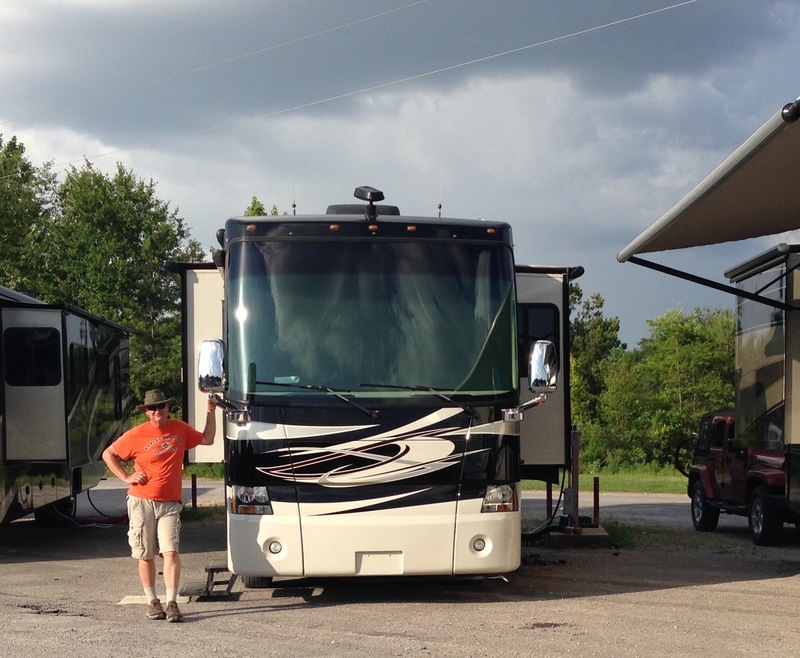 After trying to get the GPS set for our first location, Jasper, Tennessee, Bill started the coach up….and the front jacks would not retract. This was an issue we had looked at several times as it was a continuing problem since we bought it. Long story short, we spent the day waiting to get a call to bring the rig in for both the A/C and the jacks. And to not embarrass Debbie, she had to shake up a supervisor as we had not phone call by 2:00. So we had new jacks put on by 3:00 and now we have to spend another night to have the A/C looked at….will we ever leave Red Bay? Thursday, June 18, 2015 We were up again at 5:30. We really want to leave but we would like to resolve the A/C issue. So we got ready and were ready for a phone call to be in Bay 7 by 7:00 am. But after a relaxing breakfast and time to think (and feel the A/C) we decided to leave and start heading east. So Bill went over to talk to the Shop Foreman. He said they were booked today anyway, so it would be another day. So our paperwork was processed and ready to us to settle this new bill with in 40 minutes. Bill returned home to prepare to move. Debbie went to the Tiffin Parts Store (near the laundry room) to get one more thing. The prices there are sold at dealer cost! And then she checked out with the service cashier and then again at the Campground office. The stay this last night was gratis since the jacks were a “do over.” But the jacks cost as much as the new exhaust pipe. We know it was the right thing and we feel confident we will be good to go for another year. We plan to return yearly for our annual service. So off we headed to Jasper, Tennessee. We decided to make it an easy day to recover from the stress of the early service work and dealing with the same issues over and over. To us, it wasn’t that big of a deal as everyone is only human. We do feel we will be better customer’s next time. So our next blog will be a bit entertaining as we share how this easy 3 1/2 hour trip turned into six and it was anything but easy! And one part fell off in the middle of a torrential rainstorm. We heard there is a serious storm called “Bill” going across several states….so stay tuned! Our final thoughts: We have learned so much these past few weeks. 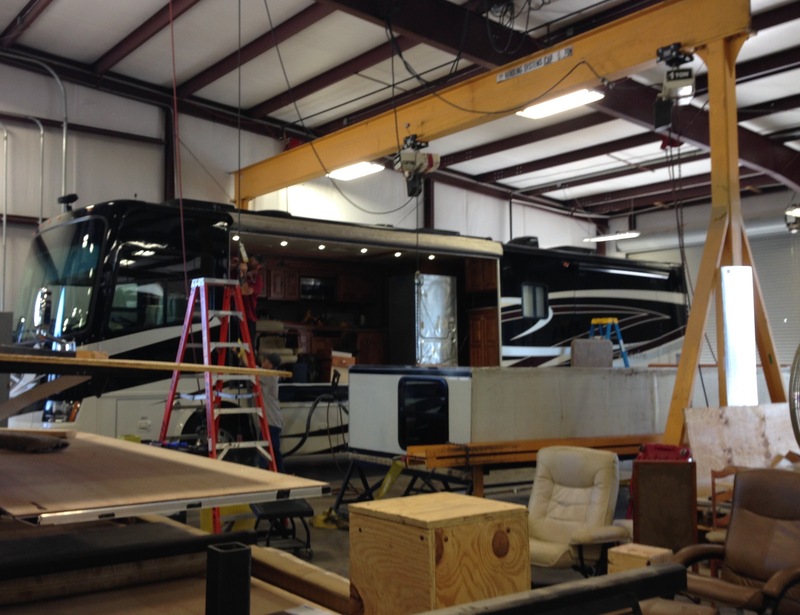 Several things apply to owning a motor home and the full-time lifestyle – as well as coming to the Tiffin Service Center. First, you really need to be flexible. Patience is invaluable. And probably the best attribute is to have a sense of humor! But for us, it’s also all about our faith. That keeps us grounded and when we feel so helpless and out of sorts from things out of our control, we can just trust the Lord that He is in control and somehow, things will work out for the best! We loved our time in Red Bay and can’t wait to return! 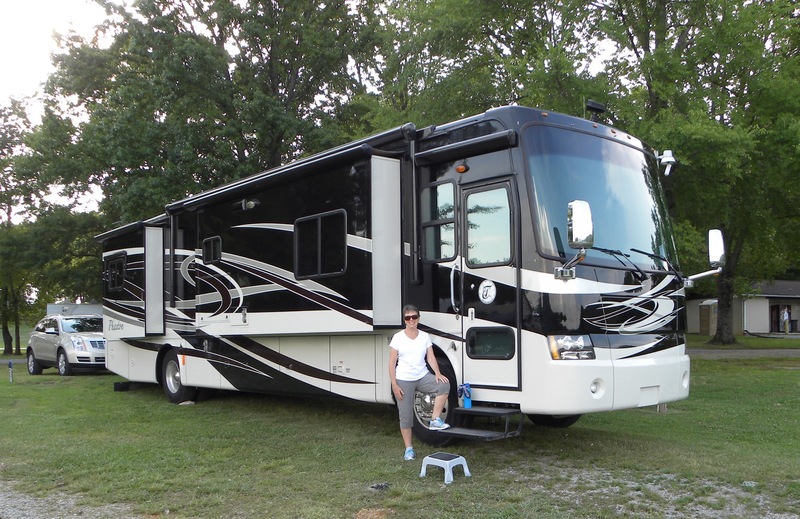 Bill has his own reason’s for preferring the 40′ Phaeton QTH, but for me, Debbie, it was the testimony of an owner who brought their new “used” Class A motorhome to the Tiffin RV Service Center in Red Bay, Alabama after they bought it from a private party. They planned to update a few things. While the technicians were going over their rig, they discovered there were a few recall issues. The main one was fixing the wet bay area and another was a slide floor. And at no charge, it was covered by Tiffin’s “Good Will” warranty. This made me really like the brand! Since we were buying an older motorhome, 2010, we felt we should bring it back to the mecca (using the definition) “any place that many people visit or hope to visit”) of Tiffin. We heard good things about the service in Red Bay, but we also heard there is usually a wait. Since we were trying to meet a family obligation after buying it, we wanted all the information we could get about the process. So first things first, we googled “Tiffin RV Service at Red Bay, Alabama.” Sadly, there wasn’t much information about it. But a few bloggers shared their experiences, which weren’t all that favorable. So far, we are thankful we have had nothing but a positive experience here. We did find two interesting blogs about other Tiffin Owners experiences: RVWanderlust and 2toTravelPhaeton. Neither blog prepared us for the drive to Red Bay, nor how overwhelming it is when you first check in! 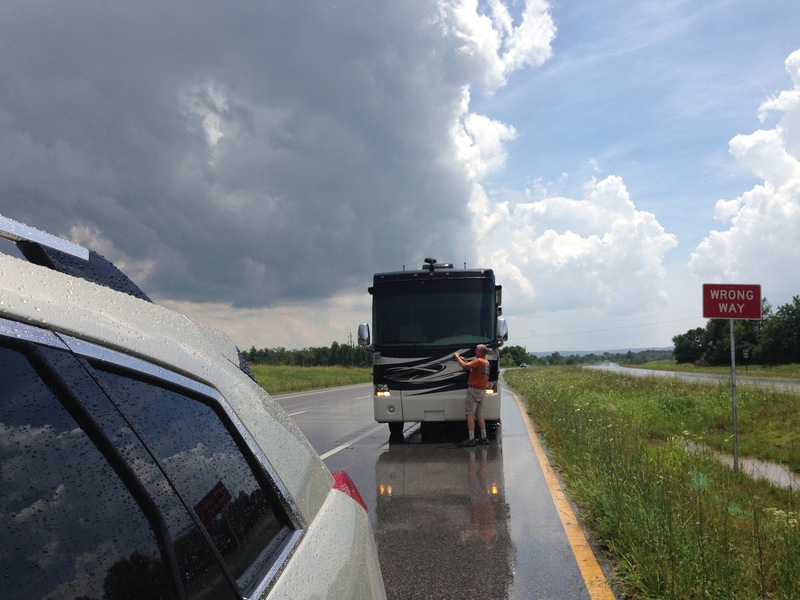 Part of us being overwhelmed was Bill’s inexperience in driving the motor home while I was either leading us in the small towns, or following Bill on the highways. Whenever we need to learn about something, we think it’s best to go right to the horses mouth. Since we couldn’t find the answers on the internet, we called the Service Center at (256) 356-2769. A technician in the Service Department said they don’t make appointments, it’s “first come first serve” and the current wait was anywhere from 4 to 6 weeks. You arrive (must come in person) check in, and when it’s close to our “turn,” you’d get a phone call to bring the RV in. In other words, we could make a two week family visit while the clock ticked. Thankfully, we pray every morning and ask for the Lord’s help and guidance. We actually “stumbled” on what became the best possible park for us! 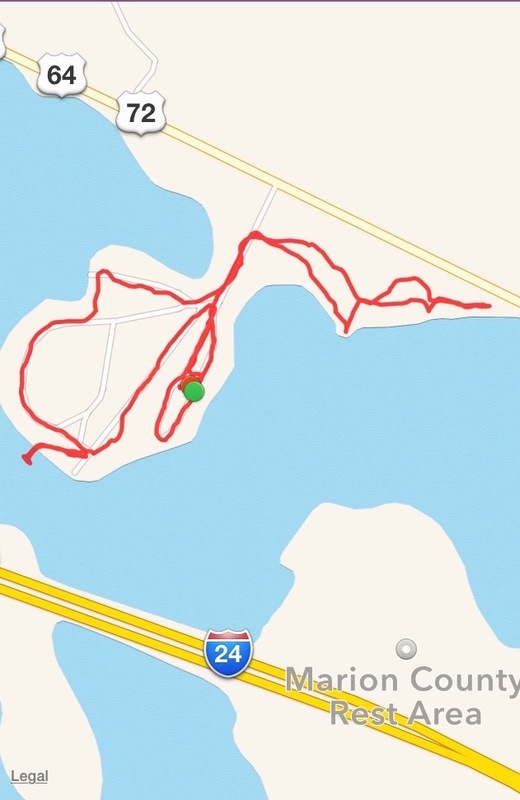 Somehow, the GPS went a bit haywire and I (Debbie) was leading Bill. So while it told me to go one way, I was following the signs to the Tiffin Service Center. I knew Bill was stressing out after the harrowing drive on a very narrow and winding road (for 23 miles). 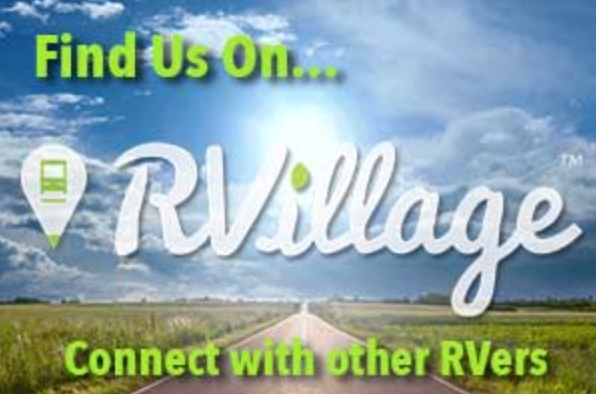 I needed to find a place to park….and then I saw a sign, “RV Park.” I honestly didn’t realize what we pulled into, but it turned out to be the best choice, Red Bay Self Serve RV Park! Their telephone number is (256) 668-0526 and the address is 717 4th Street Northwest, Red Bay, AL 35582. We parked here from May 19 – June 11, but for nearly 2 weeks, we were not there, just the RV. We felt safe there as there were enough other Tiffin Owners, the owners check the lot daily and it’s in a good area. Also, unbeknown to us, it is very close to the Service Center, just a few blocks within walking distance, so the Tiffin Employees can also easily come by. We’re not sure if they go to the other “off site” campgrounds, but when we said this was where we were staying, the response was, “Good, employees can come there.” And they did! By the time we arrived to the Tiffin Motorhomes Service Center on May 19, to get our “number” the wait was down to 3 1/2 weeks! We now could easily work around this with our scheduled family trip (to spend time with Bill’s 94 year old mom). We signed in, and planned to leave in two days. We also needed to find someone to add the tow bar to our car and take care of some additional business. And Bill needed a day to unwind after his harrowing 720 mile journey in four days! We checked into the Service Center, also known as the Allegro Campground (which has many stipulations) and were a bit overwhelmed. They gave us a “Guest Guide” that was full of everything we needed to know and more. But the main thing was that when we drove our car there, but didn’t know we needed the VIN and our odometer reading. So we had to rush back, get that and then filled out the questionnaire. We had written out our list of 20 items we wanted looked at, so we provided it to them as well. We were told someone would get up with us to go over the list…but we didn’t expect Norris from Tiffin at 8 am the next morning! And two other Tiffin employees also came to check on things to finalize our “list.” We were so impressed and ready to head out with confidence we made the right decision to bring it back to it’s birthplace! To be continued, a diary of our time at the Tiffin Service Center. We hope and pray we will be as happy when we leave as we were when we first arrived! Or go to our Fun in Red Bay blog. 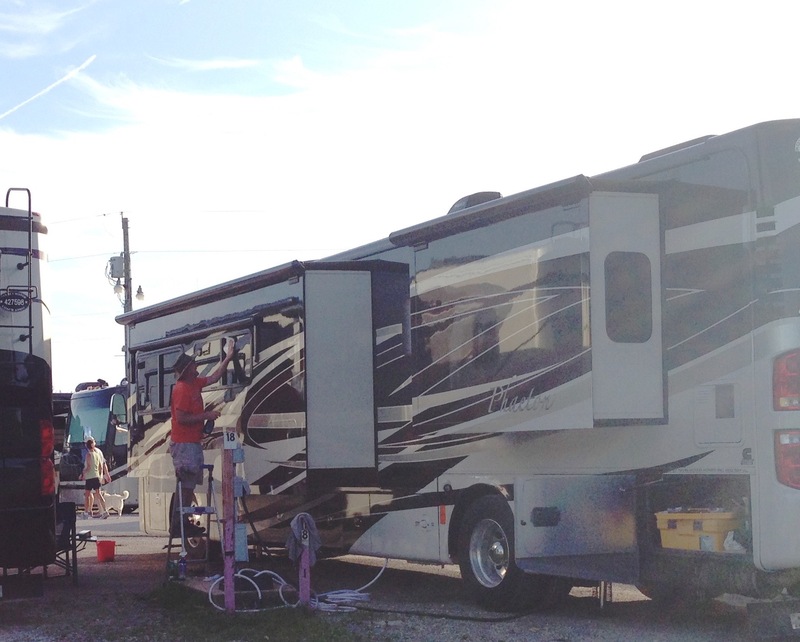 Red Bay, Alabama is the home of Tiffin Motorhomes. 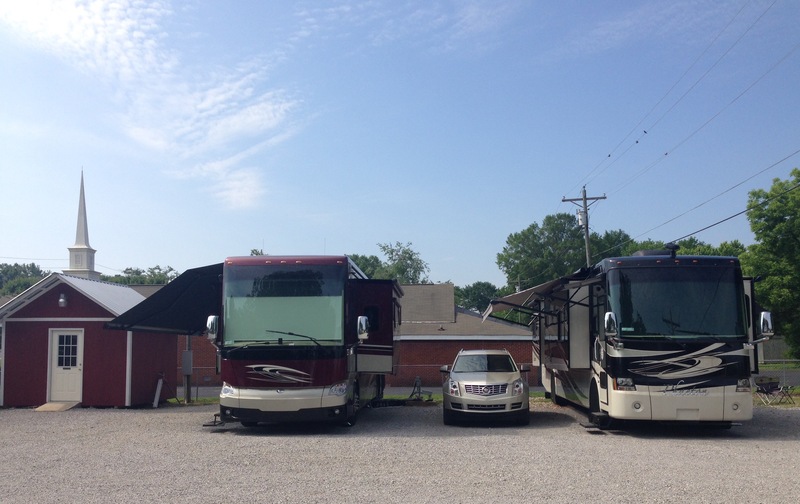 Every owner seems to try to visit at least once in their RVs lifetime. It’s hard to believe we are here, now (May 19, 2015). After years of dreaming of owning a Class A Motorhome, Bill finally talked Debbie into owning one. 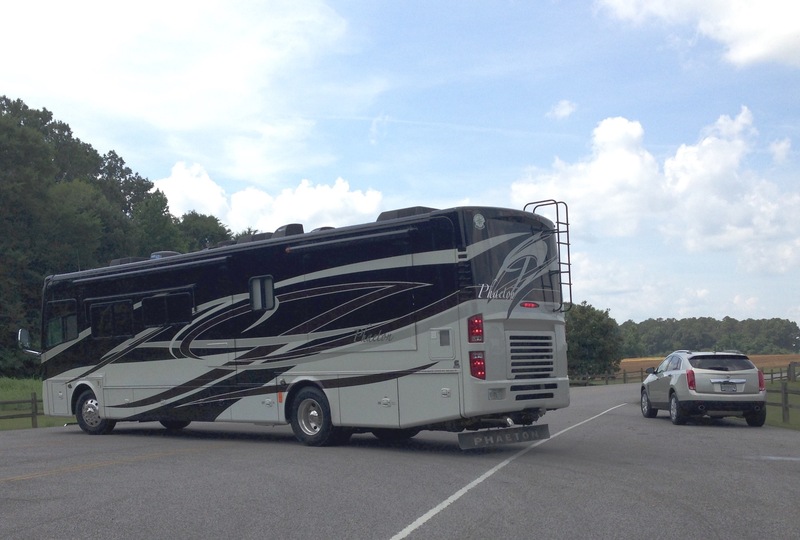 Actually, it didn’t take much after living in our 30′ Xlite Cougar 5th wheel for nearly two years. It actually suited us and we hated to trade up as it was so easy to maneuver and we found out we could get into any Florida State Park we wanted. That was a huge goal for us, to start staying in state and national parks. For whatever reason, it took until this past March to finally try the state parks. And we were hooked. But then, we also realized we needed a little more comfort (king sized bed for his 6’2″ length – how did he sleep in a short queen bed for so long? ); wanted a bigger refrigerator since we eat most meals at home; and finally, wanted a washer and dryer. Having our own will help us manage our time better. Generally we are on the go once we get settled in our site. Of an evening, is when laundry can easily be done. It’s no fun being out in the dark with the bugs, or if there are only one or two washers/dryers, it can be very hard to do. We love this lifestyle and have learned to go with the flow so I (Debbie) made the best of it! 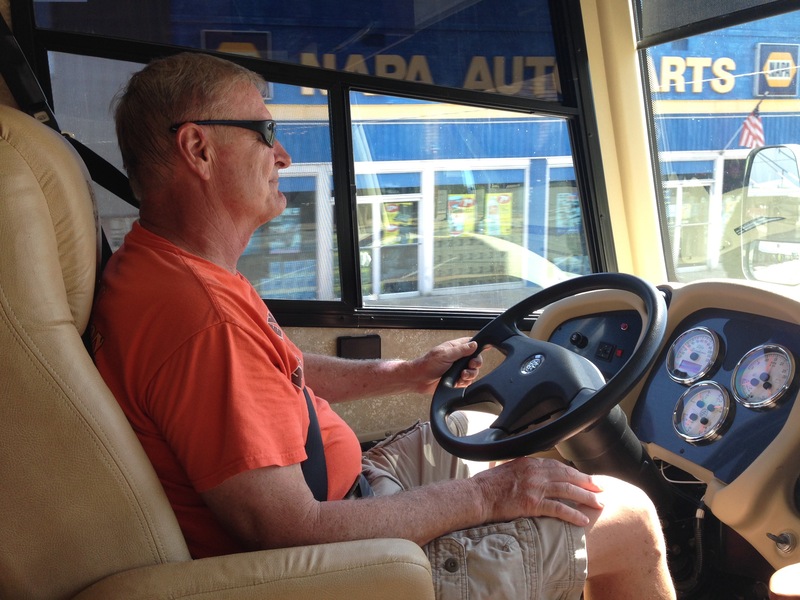 Bill has driven about anything a non CDL driver can drive. He was a Snap-on Tool Dealer for a few years, so he regularly drove that big rig. He drove my step dad’s Class A once a short distance. He was not intimidated. But Debbie on the other hand, said if he wants her to help drive, her limit was an arbitrary 35′ model. Driving away from the owner’s home. We detailed the drama up to the actual purchase here. And there was drama until we drove it away from the seller. That is a very sad story and one we will regret to our dying day, unless we can reconcile with the seller. Let us suffice it to say, buying and selling a home is very stressful on all accounts. And at our ages…we all have aging parents, new grand babies and our own health concerns thrown into the mix. So finally on May 14, after a tense seven days of waiting for the financing to be finalized (we will never recommend Essex Credit, a division of Bank of the West as a place to go for full timers who do not own a home), also buying a new car, and visiting Debbie’s mom for a surprise Mother’s Day weekend (and her dear husband we both love as our “step-dad” – he’s in the battle for his life), we drove away in our new motor home. We just drove a few miles to a campground near the seller’s home. Everything seemed to work ok on the way there, but there wasn’t any challenge, like rain. As we settled in, we began to discover a few things didn’t work, such as the washing machine. And our list began to grow and by the time we arrived here, we had 19 things on the list! As many other full – timers, we all seem to say we prefer only going about 200 to 250 miles for an ideal travel day. We plotted it out, first stop Suwannee River State Park, Live Oak, FL (243 miles) and then to Walnut Creek RV Park, Troy Alabama (223 miles) and then to Red Bay (261 miles) for a total of 721 miles. This seemed reasonable. What we hadn’t counted on was the heavy traffic, the GPS not working in the Rig (Bill was spoiled with the fabulous navigation system in our Ford Truck) and then rain….and the wipers not working properly! Bill said this entire trip has been a “white knuckle” experience. So much for me (Debbie) ever wanting to drive it! The next blog will tell about what to do once you arrive in Red Bay and how this experience is. We’ve heard great stories about it….but just from our initial arrival here, there is a lot you don’t know until you get here. And it seems like no one wants to tell you about it! Let’s just say, it’s been an adventure of it’s own! Suwannee River State Park – a bit of a challenge to back in but we did it! 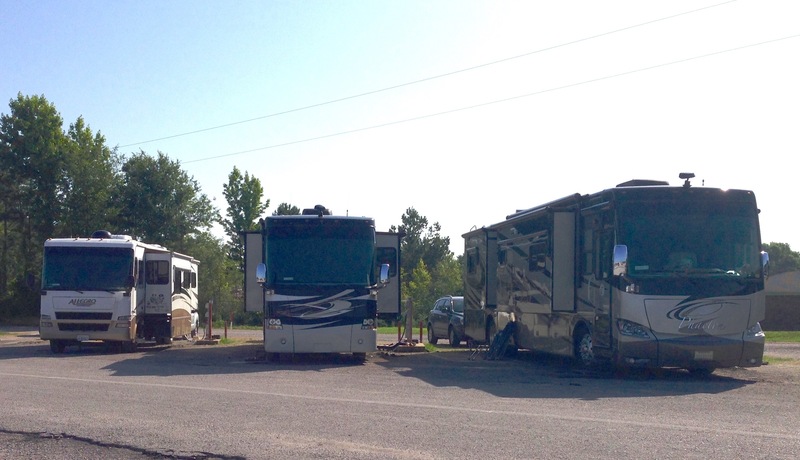 Walnut Creek RV Park – third time is a charm. Easy pull through site! So this scripture can illustrate how our trip went….There were moments of little faith, but in the end, it worked out! Up next, a series on what Red Bay is all about for Tiffin Owners! First, our favorite view, location and doing what we love. Below is our first year travel itinerary with hyper-links to those locations where we have posted a blog. For some, we don’t have a separate blog, so that is incorporated in the “Summary of our first five trips.” We’ve included our “rates” for these. A 1 means we will never return and 5 means we will be back! If there is an * by the name, we have stayed multiple times. This is our initial itinerary. For the next year, see our It’s Our One Year Anniversary as Full-Timers blog. These are our locations visited since September 2013, with the most current first, with a rank based upon OUR experiences. We tried to include the addresses, phone number, dates we were there, how many nights and a brief description of our time there, unless there is a hyperlink to the blog about our time there or to Compendium (our review of the campground). Reflecting back (in March 2015) we have really enjoyed every location and have seen some great sights and learned a lot of history about the founding of this great country. If there is an * by the name, we have stayed multiple times. The ranks are our personal opinions, with 5 as we must stay there again down to 1 where we will not stay again! 23). Lake Aire RV Park & Campground, (rank 3) 4375 Hwy 162, Hollywood, SC 29449; Phone: 843-571-1271; 5/13-19/2014 (6 nights) (Toured Charleston, SC). LOVED the history here. Campground was ok. See the hyper-linked blog. 22). Campfire Lodgings, 116 Appalachian Village Road, Asheville, NC 28804; (rank 3) Phone (828) 658-8012; 5/9-13/2014 (4 nights). GREAT time. See the hyper-linked blog. 21). *Mayberry Campground, (rank 5) 114 Bunker Road, Mt. Airy, NC; Telephone: 336-789-6199 5/6-5/7/2014 (3 nights). Mt. Airy is Andy Griffiths’s home town and his show, Andy of Mayberry, was modeled after the town. The town has exploited this in a good way and have so many things to help you relive that wonderful show. We loved it and everything about the area. We wanted to watch some of his movies and/or TV shows afterwards, but the only way was to buy DVDs and we can’t carry around anything else in our RV! Very welcoming and relaxing. Great hiking nearby. 20) Jellystone at Natural Bridge #160; (rank 5) PO Box 266,16 Recreation Lane, Natural Bridge Station, VA 24579; Phone: 540-291-2727; 5/5-5/6/2014 (1 night). We did as much as possible here for an over nighter. Main thing was to see the Natural Bridge! 19). 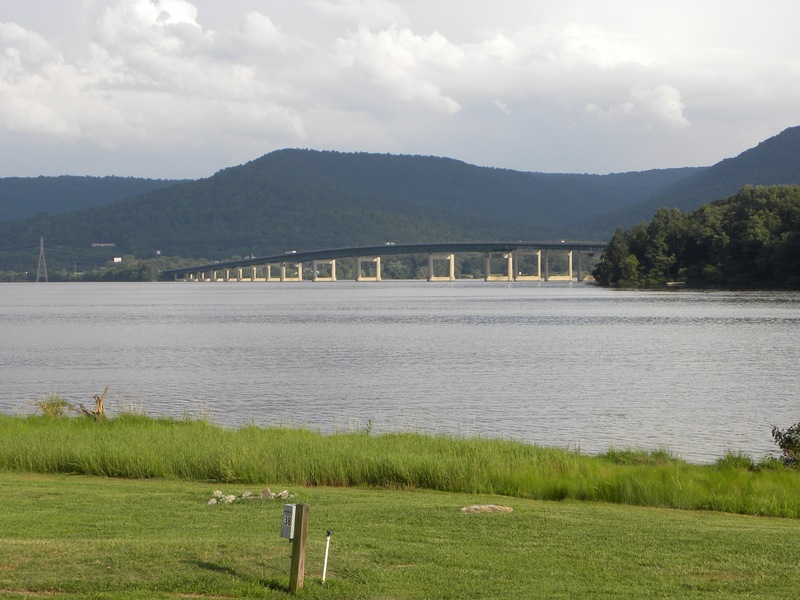 Staunton/Walnut Hills KOA, (rank 5) 484 Walnut Hills Road, Staunton, VA. 24401; Telephone # (800) 562-7566; 5/2-5/4/14 (2 nights). Beautiful resort and great location. We had a blast and hope to return. 18). 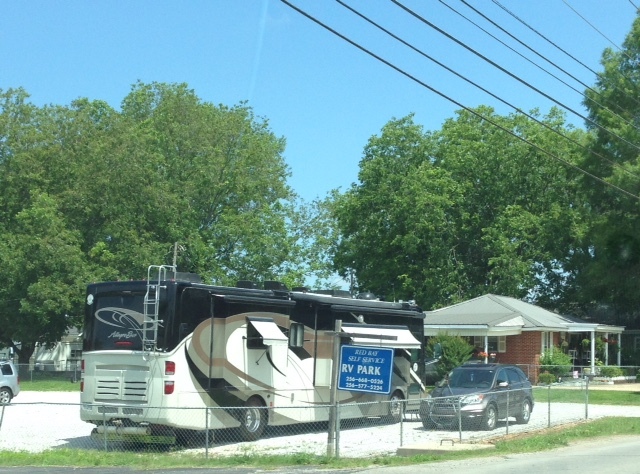 North Fork RV Resort (small spaces-staff not very pleasant), (rank 1), Front Royal, VA 5/1-5/2 (2 nights). We had a fabulous time hiking and exploring. But the resort was not pleasant. Too small of spaces and the staff was borderline rude. 17). *KOA Fredericksburg 4/18-5/1 (13 nights), (rank 5) Jessica’s birthday and family time. 16) Waterway RV Resort, 850 Cedar Point Blvd., Cedar Point, NC. 28584, (rank 4); telephone # (888)318-1243; 4/13-18/2014 (5 nights). Read about this great time in the hyper-linked blog. 15). *KOA Fredericksburg, 3/26-4/13/14 (13 nights), (rank 5) Took Colin to Doc for 7 mo check up. Family time. 14). *Pirateland, 5401 S. Kings Highway, Myrtle Beach, SC, (rank5) 3/22-26/2014 (4 nights). We found more to do and really enjoyed our time here. 13). *Jacksonville North / St. Marys KOA, (rank 5) 3/22/2014 (2nd stay-one night). Again, just a stop over. 12). *Jacksonville North / St. Marys KOA, (rank 5) Scrubby Bluff Road; Kingsland, GA; Phone: 800-562-5220; 1/7-10/2014 (3 nights). This was a convenient stop coming or going to Sebring and heading to our daughter’s home. 11). *Pirateland, 5401 S. Kings Highway, Myrtle Beach, SC, (rank 5) 1/2-7/2014 (6 nights). We loved the beach at Myrtle Beach and tried this campground, which we now preferred over the other one. Friends from our first church now have a home here so we got up with the husband to catch up, went to their church and learned more about the area. But it was freezing (literally) so that put a hamper on things. But we found some great historical places to visit. We can walk on the beach no matter the weather. 10). *KOA Fredericksburg, 12/19-1/2/2014 (rank 5) (14 nights) Christmas with Jessica and family. 9) Jolly Time Acres, (rank 4) 289 home Taylor Road, St George, SC 29477; Dec 18 (one night). Bill stayed here alone as I flew up to Fredericksburg to care for Colin who was pretty sick. Bill drove up later after he handled a few things at home. 8). Panama City Beach RV Resort, (rank 5) 4702 Thomas Dr., Panama City Beach, FL 32408, Phone: 850-249-7352; 11/26-12/1 (5 nights) With friends. No blog. We stayed here over Thanksgiving. The park was fabulous, but it was freezing cold believe it or not. 7). 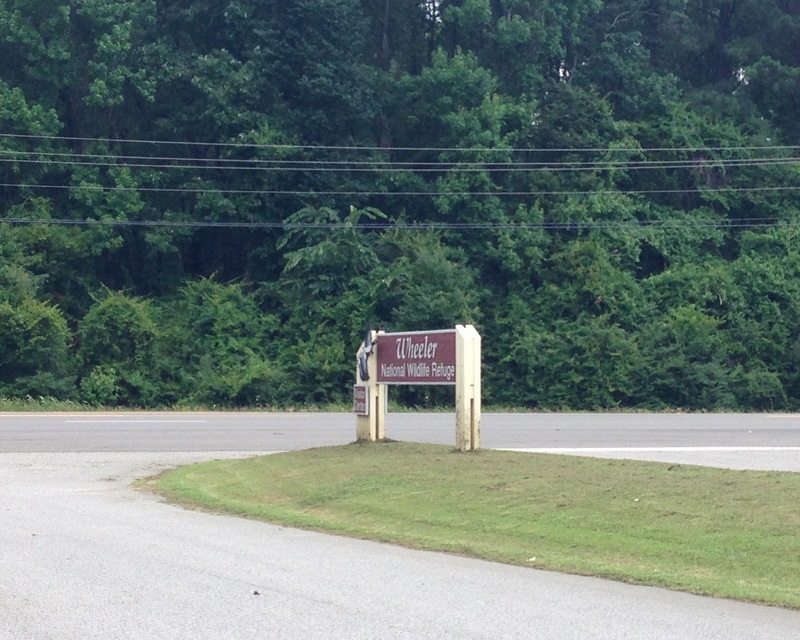 Scenic Mountain RV Park, (rank 3) 2686 Irwinton Road/Business 441 N, Milledgeville, GA 11/22-11/26 (4 nights). No link to this blog, but I hope to write more one day and show pictures. This was a fascinating little town, originally the capital of Georgia. So much GREAT history. We rank this as having our favorite tour of a historical building, the Governor’s Mansion. The tour guide was a local college student majoring in history. 6). 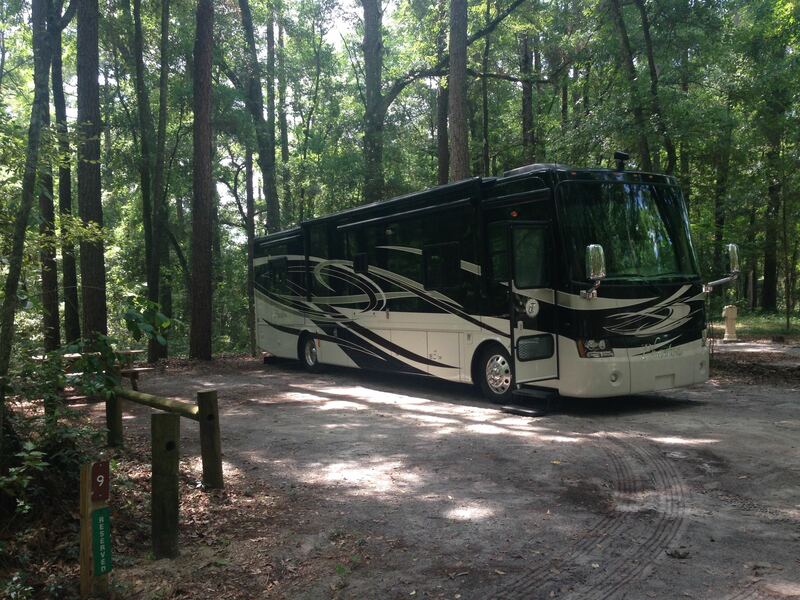 Forest Lake RV & Camping Resort, (rank 2) Thousand Trails Drive, Advance, NC 27006 11/19-11/22 (3 nights). No link to blog because this was such a short visit. We began to explore NC and had a few great hikes, met up with Bill’s cousin and we toured and throughly enjoyed the Billy Graham Library/museum. 5). *KOA Fredericksburg, VA, (rank 5) 10/10-11/19 (40 nights). No link to blog because this was family time. 4). Ocean Lakes Campground, Myrtle Beach, SC, (rank 3) 10/7-10/2013 (3 nights). No link to a blog. This was a nice resort and we had a good time. 3). 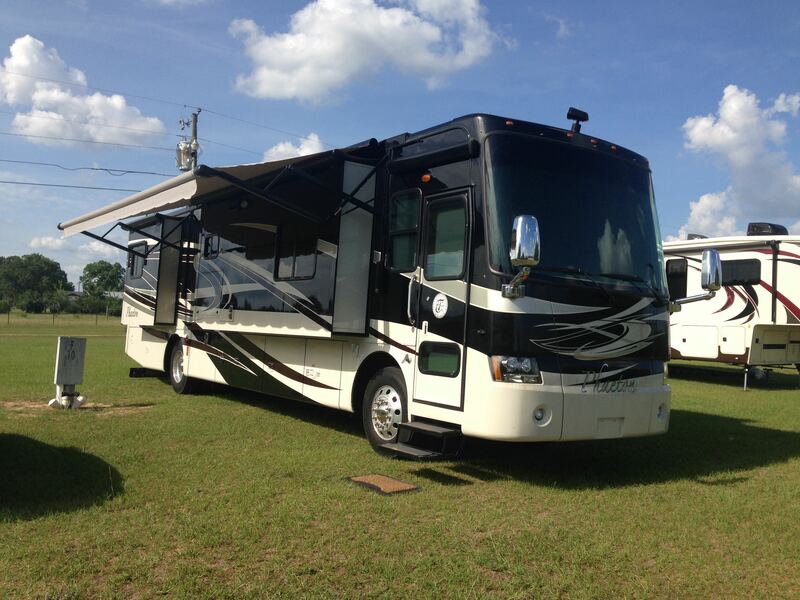 Jekyll Island Campground, (rank 5) 10/4-6/2013 (3 nights). Oh we just loved this time! Read about it in the hyper-linked blog. 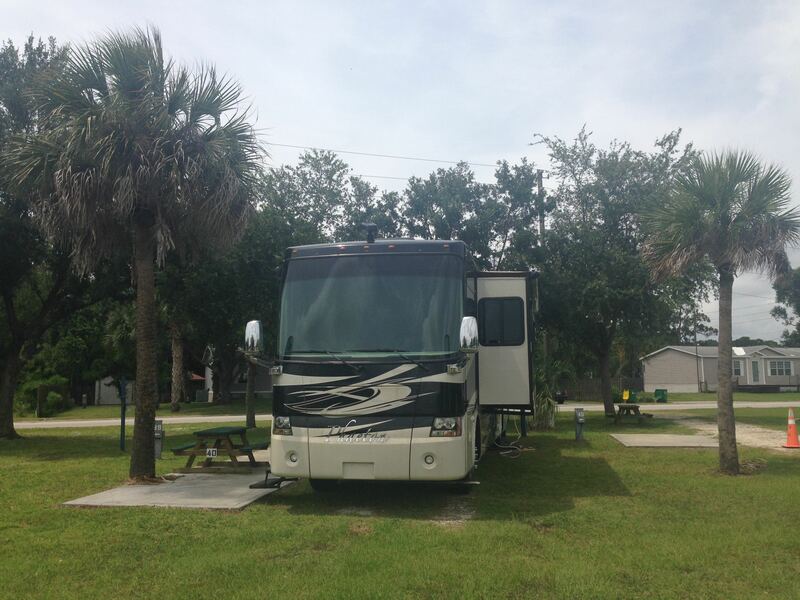 2) Port St. Lucie RV Resort, FL, (rank 5) a Passport America Campground, 9/17-9/21/2013 (4 nights). Fantastic!Read about it in the hyper-linked blog. Our only complaint was that the beach was about a 6 mile drive. The Campground is very isolated and not in that great of an area and it was so windy on the beach every day we were there. Not sure if this is typical or just the time of the year. 1). 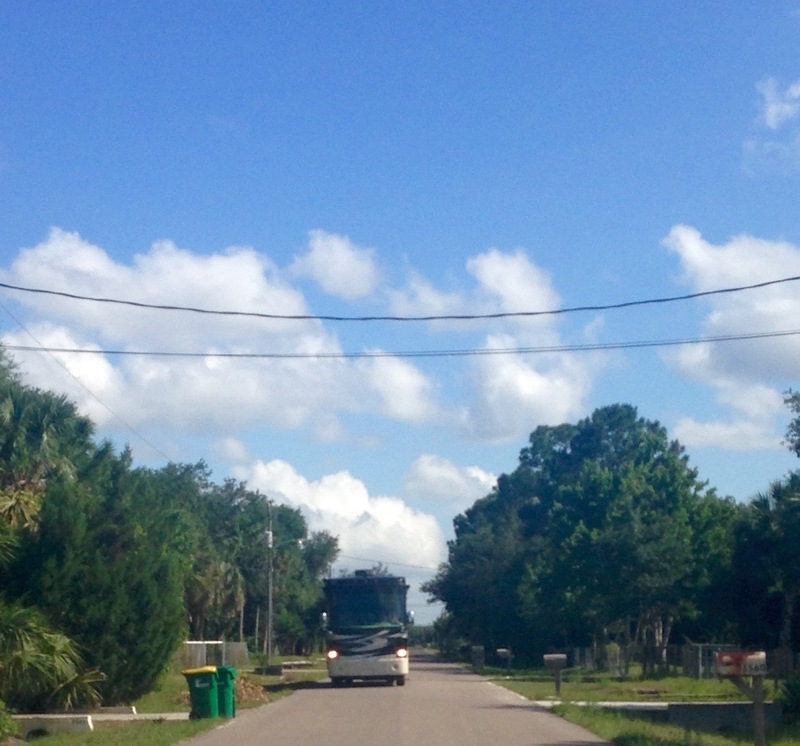 Tampa East, FL, Sun RV resorts, (rank 3) 9/5-9/7/2013 (2 nights). Great time. Read about it in the hyper-linked blog.